Now available: NEBNext Ultra II RNA Library Prep Kit for Illumina, with improved performance and a broader input range. This original version of the Ultra™ RNA Library Prep Kit enables non-directional RNA library preparation in a streamlined workflow. However, we now recommend use of the more recent NEBNext Ultra II RNA Library Prep Kit for Illumina (NEB #E7770), which has been further optimized to provide increased yields of high quality libraries from a broader range of input amounts. The NEBNext® Ultra™ RNA Library Prep Kit for Illumina® contains reagents for preparation of non-directional RNA libraries for Illumina sequencing. Please note that adaptors, primers, rRNA depletion reagents and poly(A) mRNA isolation reagents are not included in the kit and are available separately. 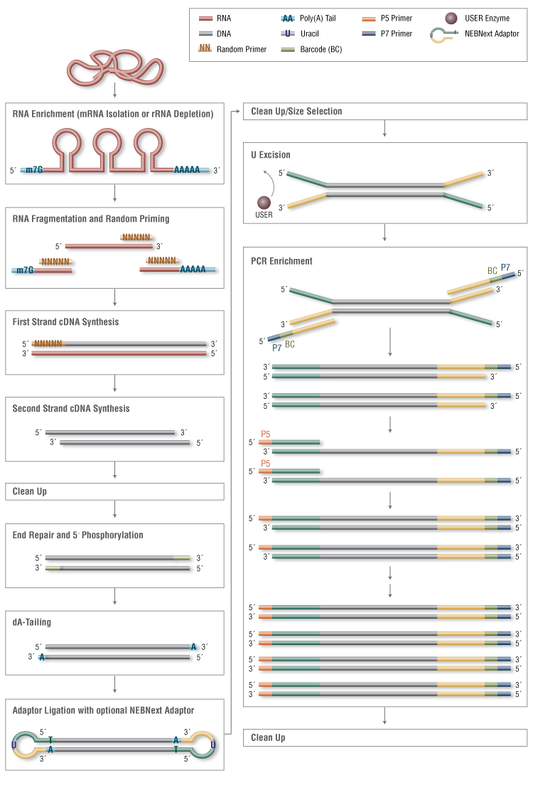 Each kit component must pass rigorous quality control standards, and each set of reagents is functionally validated together by construction and sequencing of a library on the Illumina sequencing platform. 10 ng, 100ng or 1 μg of Total RNA (Universal Human Reference RNA, Agilent #740000) was used as input for libraries, following the NEBNext Ultra™ RNA protocol and using NEBNext Poly(A) mRNA Magnetic Isolation Module (NEB #E7490). Libraries were sequenced (single end reads) on the Illumina platform (GAIIx). Good coverage across expressed transcript was obtained for each input amount. What is the difference between the NEBNext Ultra Directional RNA library prep kit for Illumina (E7420) and the NEBNext Ultra RNA library prep kit for Illumina (E7530)? 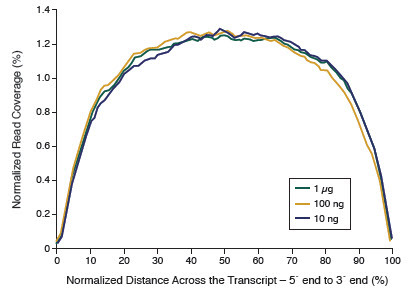 What is the starting material I need to use when preparing libraries using the NEBNext Ultra Directional RNA kit? Where do I have to start the protocol if I have purified mRNA or Ribosomal-depleted RNA? Does the kit provide adaptor and primers?